Sooner or later, if you ride long enough, you will suffer a road rash incident. Of course, road rash is the scraping off of the outer layer of skin called the Epidermis and may extend down into the next layer called the Dermis. While a road rash may not bleed a great deal, it is still painful due to the damage to the nerve endings in the skin layers that were cut. First, cover the wound the best you can until you get home. Then, use a syringe to clean the wound by squirting it with a solution of mild soap and water or an approved antiseptic wash such as saline solution. Make sure the wound is clean of any dirt or debris. If not, gently use a gauze pad and try to remove the dirt or debris out of the wound, wash it and check again to make sure it is clean. If this is not done, the wound could easily become infected. If you can’t get everything out of the wound using the above procedure, then go see your healthcare professional for treatment. Most minor road rash won’t bleed much. But if your wound has not stopped bleeding after 15 minutes of direct-applied pressure, or if your cuts extend deep into the skin, or the edges of the cut has pulled apart, then you most likely are going to need stitches. While Tetanus is usually associated with stepping on a rusty nail, you can develop it in skin that has been torn or burned. As a precaution, if you have not had a Tetanus shot within 10 years, it is a good idea to get another booster shot. Once the wound is clean, cover the entire wound with semi-permeable medical dressing such as Tegaderm, Bioclusive or Second Skin. Secure the dressing with adhesive tape made to secure bandages. Remove the dressing every couple of days and check for infection or to see how the wound is healing. Keep the wound moist and covered until healed. Of course one way to prevent road rash, besides not falling off of your bike, is to wear clothing made to protect you in case of falls. 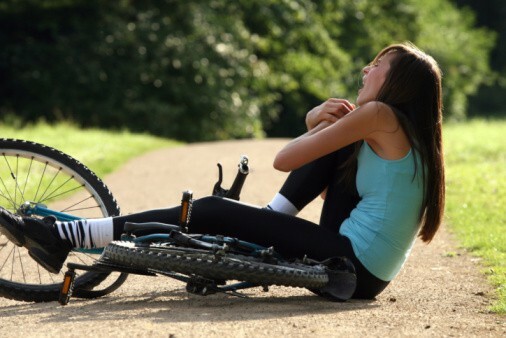 Rash guard clothing not only covers exposed skin and protects you from sunburn, but it also lessens the severity of road rash should you fall off of your bike. Being observant of what is going on around you and obeying all safety rules will minimize the chance of falling and suffering road rash. However in the event that it happens, clean and dress the wound according to the tips in this article.